Every year the earth swings between Jupiter and the Sun. Jupiter and Earth are closest together at this point. After going out to a show with my wife, I captured Jupiter with its Great Red Spot and moons Io, Europa, and Ganymede. The breeze was gusty and the seeing rough at times, but my new tripod and wedge held steady for the image below. 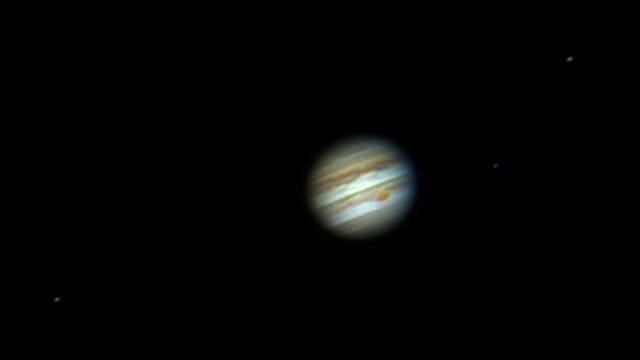 Jupiter with moons Io, Europa, and Ganymede (L to R) from Austin, Texas 2017-04-07 10:25 PM CDT. Questar 1350/89 mm telescope with a Dakin 2X Barlow lens and ZWO ASI120MC planetary video camera. Gain 46, exposed 77 msec captured in oaCapture running on macOS. Best 256 of 2000 exposures stacked at 2x and deconvolved in Nebulosity. Final crop and exposure tweaks in Photoshop. I've been wanting to try out Autostakkert 2 for a while and finally got around to fireing up a virtualized copy in macOS. The stacking workflow is easier than with Lynkeos although the final results where very similar. I took the opportunity to use a little lighter touch in the enhancement and like it better. This image includes a 150% drizzel and RGB alignment. Jupiter with moons Io, Europa, and Ganymede (L to R) from Austin, Texas 2017-04-07 10:25 PM CDT. Questar 1350/89 mm telescope with a Dakin 2X Barlow lens and ZWO ASI120MC planetary video camera. Gain 46, exposed 77 msec captured in oaCapture running on macOS. Best 52 of 2000 exposures stacked at 1.5x in the amazing Autostakkert 2 and deconvolved in Lynkeos. RGB aligned to reduce atmospheric diffraction. Final crop and exposure tweaks in Photoshop.